Good to see you out and about spreading the word. I am though still unsure what is about what you are doing at AMPA that is not also already being done within the Practice Network of the subject association (MeCSSA). You suggest in the website blurb that there are plans afoot to launch a journal but isn’t there already the JMP and MERJ journals not to forget the ADCM journal? The MeCCSA Practice Network already works towards the recognition and development of practice as & practice-based research and regularly funds (yes they have funding) events along these lines. It also supports the annual JMP Symposium as well along with other projects. As someone who was involved with AMPE all those years ago and was there when it merged with MeCCSA to become the Practice Network I am aware that perhaps the voice of practice educators is still not well heard. My question is this though, is it better to build on what we already have or to build new and competing associations? I did ask this question before but I never received an answer so thought I would ask again. It seems to be that in you penultimate paragraph you pose a question which you have already answered. You write: “I am aware that perhaps the voice of practice educators is still not well heard.” So, while MeCCSA continues to do an excellent job for its members – some of them also members of AMPA – it is clear their is a task that is not being undertaken. On that occasion the speakers also included the MeCCSA Practice Network Chair, Joanna Callaghan, and the questions to both speakers and the ensuing discussions helped clarify the different roles of each group. Responses to Prof. Kemp at Salford also seem to have strengthened the sense that practice educators see the need for a body other than MeCCSA to further their cause. 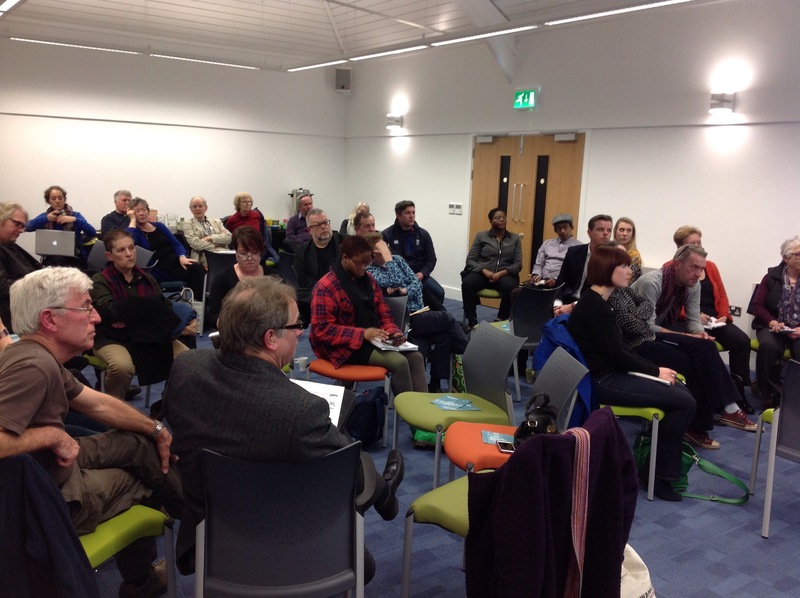 The Goldsmiths and Salford events point, too, to another area where AMPA’s input is valuable and distinctive. Neither institutions nor academics have a proper understanding of what we mean by Research (and PhDs) by/into/through practice. AMPA can help to bring about that clarity and to point practice academics to the most appropriate route for them through the maze of options. In many subject areas many of us have brought our considerable practice, expertise and experience into university classrooms, workshops, studios and so on and we see AMPA as being better placed to speak for and support us. MeCCSA continues to do a first-rate job for those seeking to move their practice into research (what the AJE irritatingly referred to as ‘the step up to research). AMPA meanwhile is the body for those who want to ensure that practice and practitioners are truly valued for the contribution they make to HE. There are lessons to be learned from a range of disciplines, including fine art, journalism, film making, production – even medicine and education not to mention the increasingly important business of interdisciplinarity. AMPA is the form where those discussions can take place. Thank you for your clear and articulate response to my questions. I guess I am still trying to understand the different roles of the two organisations as from where I sit I am still struggling to see a difference. It maybe that is due to my particular point of view which I will outline below. The main issue that concerns me though, is that we seem to be going in circles. I mean why was AMPE merged into MeCCSA? I am not party to the reasons why, at the time it was explained as a needed in order to sustain and articulate the voice of practice educators. Clearly then that has not been terribly successful. What then has changed? I feel I should clarify my personal position in relation to this debate. I am not that drawn to practice-based, practice as or other formulations of the practice/research debate. That is not because I don’t see the value or importance of these debates, or that I don’t practice myself, or that I am not engaged in teaching practice. I am all of those things. The big problem for me as I see it, and one that will be further exacerbated by the “rise of the TEF” is the place for pedagogy in all these debates. I am sure some will say that pedagogy is at the heart of these debates and to a certain extent it is. But believe me if you are interested in pedagogy, are researching pedagogy, are publishing in pedagogy… It is a very very lonely space. I don’t go to any of the excellent conferences and symposiums you mention because they rarely if ever concern themselves with pedagogy other than as a by-product of research. Personally I am not that enthused by what seems to be such a pedagogically disengaged position. Anyway, the point I am making is that despite claims to the contrary I do not see a space for pedagogy in the MeCSSA Practice Network (I would comment that Jonna has been very supportive and that is very valued but as I am often pretty much the only person at practice meetings with an interest in pedagogy I can see it is not of great interest to other educators). Nor do I see pedagogy as central to AMPA members aims and objectives. There maybe a space I am told but I don’t see it. It does seem to me as though we, as media practice educators, are not pedagogically engaged. Yes I recognise the ways in which we/you/us have brought “our considerable practice, expertise and experience in to classrooms” but the question is are we doing this as reflective practice educators or as practioners and researchers?